Council Bluffs RAGBRAI® Website Rolling Along !! Order your RAGBRAI® T-shirt, Volunteer, and more online! COUNCIL BLUFFS, IOWA- The Council Bluffs local RAGBRAI committee announces that www.councilbluffsragbrai.com is online! The public is invited to log onto the website for information. Pat Barton and Geoff Hubbard have spent many hours assembling the details you’ll find on the site. “We encourage our residents to log on because we are looking for housing and volunteers from our community. This website is a resource of information for our residents as well as for riders,” said Barry Cleaveland, Executive Committee Chairperson. Included are Mayor Tom Hanafan’s welcome letter, and tabs for camping information, housing, long term parking, vendor and volunteer information. In addition, there’s a space for ordering the 2013 Council Bluffs official RAGBRAI T-shirt on the website. “The unusual and highly desirable shirt includes a solar sensitive panel,” said Kathy Fiscus, Chair of Publicity for Council Bluffs RAGBRAI. 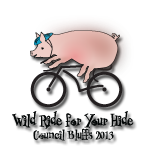 “The Council Bluffs official RAGBRAI pig riding a bicycle expands into many colorful panels of the pig when the shirt is exposed to sunlight,” said Fiscus. The theme, “Wild Ride for Your Hide” is printed on the front. A slice of bacon with the phrase, “Sizzle In Your Seat” is printed in color on the back. “It’s all in good fun,” said Fiscus. While www.councilbluffsragbrai.com is a work in progress, the public is invited to log on now and return several times for updated information. Riders for the event will be in town July 19-20, with the official Council Bluffs departure and start of the ride across Iowa early Sunday morning, July 21.